ASHTABULA - Ashtabula County having a great year for fishing, especially for walleye, was a frequent sentiment shared during a reception for the Experience Ashtabula County event held at the Lodge and Conference Center on Wednesday, July 18. On Thursday, guests to the reception had the opportunity to learn just how true that was, as they headed out on charter fishing boats for the 7:30 a.m. lift bridge in the Ashtabula Harbor to fish Lake Erie. The fishing trip was part of the special Experience Ashtabula County event organized by State Sen. Sean J. O’Brien and State Rep. John Patterson, along with the Ashtabula County Visitors Bureau. “We wanted to showcase the wonderful fishing that we have here,” Patterson said. As part of the event, Ashtabula County welcomed Ohio Department of Natural Resources Director Jim Zehringer and representatives from ODNR, other recreational and wildlife groups and the Ohio legislature to visit the county to discover the offerings along the eastern part of the state and Lake Erie. “He is a good voice for this area in Columbus,” Zehringer said of Patterson. Ashtabula County is a great area, Zehringer said. Zehringer also mentioned the covered bridges, the state parks and, of course, Lake Erie. Boat captains said they couldn’t have asked for a better day for weather for the fishing trip, as they led nine charter boats out onto the lake. Anglers had no problem catching their limit of six walleye and at least two people, including Directer Zehringer, caught steelhead. On the Eye-Trapper with Captain Greg Bogard, the people on board, including Ashtabula County Commissioner Casey Kozlowski; Debi Beck, with the ODNR Office of Coastal Management; and Travis Hartman, a fisheries biologist with the Ohio DNR Division of Wildlife, caught their limit within a speedy two hours. Captain Bogard operates Eye-Trapper Lake Erie Fishing Charters, coming up from Canfield, Ohio, to take people out on the lake with his 30-foot Baha outfitted with electronics, down riggers, wire line and trolling gear. When fishing for walleye, he leaves out of Kister Marina in Ashtabula. With charter-fishing trips, the captain provides the rods, tackle and ice for the fish cooler, and the same was true for the trip last Thursday. Bogard set the rods and helped net the fish, as his passengers reeled in fish after fish. Bogard said he sometimes makes three charter trips a day. “I’ve had visitors from Montana. I’ve had them from California...a lot of people from outside the county,” Bogard said. basin of Lake Erie as soon as the ice melts, and then around Memorial Day, he begins offering trips out of Ashtabula. He also has been impressed with the fishing out of Ashtabula this year. To learn more, visit eyetrappercharters.com. 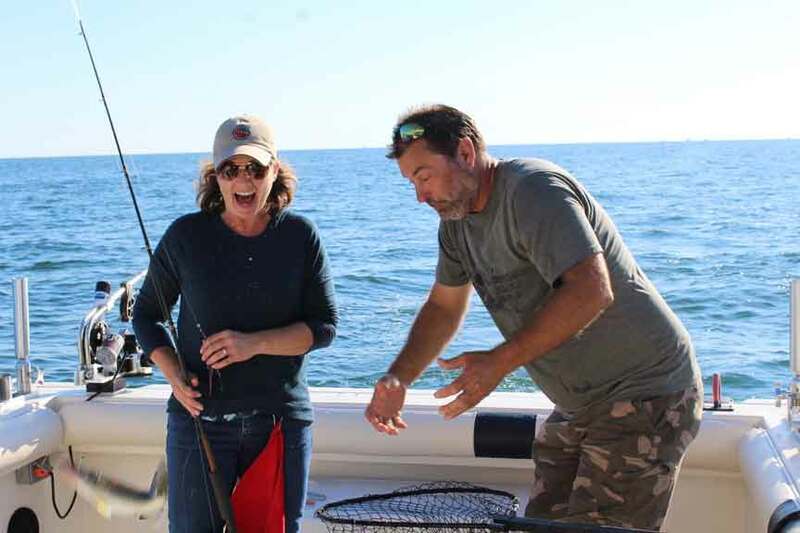 Debi Beck, with the Ohio Department of Natural Resources Office of Coastal Management, and Captain Greg Bogard react to a loose fish.